2005 Altria Shareholders Meeting: Happy 50th Deathday Marlboro! On April 28, 2005, Altria/Philip Morris held its annual shareholders meeting in East Hanover, New Jersey. Over 100 youth and adults from India, Indonesia, Nigeria, Thailand, California, Hawaii, New Jersey, New York, and Wisconsin* were there to denounce Philip Morris's global expansion. This year, Altria Group, parent company of Philip Morris USA and Philip Morris International, is celebrating Marlboro's 50th anniversary. 2005 is also the 50th anniversary of the company's overseas expansion. 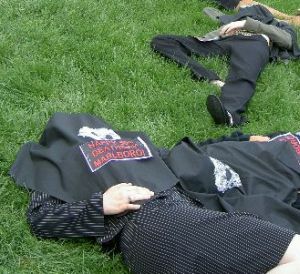 Demonstrators marked these macabre anniversaries outside the Altria shareholders meeting with a "Happy 50th Deathday" cake, black balloons, a 15-foot-high Marlboro pack labeled "50 Years of Death" and photos of the company's tobacco promotions around the world. with groups in Asia, Africa, Latin America, and Central/Eastern Europe to monitor and resist Big Tobacco's global expansion.